Saturday was a long day. It started with an audition taping for a movie role that was arranged by my agent. (Thanks LMTalent!) Usually I go to Todd Jenkins’s studio in Plano to tape auditions, or tape them at Nancy Chartier Acting Studio, but this time that didn’t work out, so Gordon Smith of Altair IV Productions agreed to shot it at our house first thing Saturday morning. Ian McAlister is a high school junior who wants to be a director, and he helped me rehearse and read with me. This audition was actually kind of hard, because there weren’t a lot of words, but there were a lot of reaction shots — that means that characters you won’t see in the audition tape are saying things and the casting director wants me to react to them without saying anything or moving around a lot. Ian helped me a lot, I think — I hope I get the part. 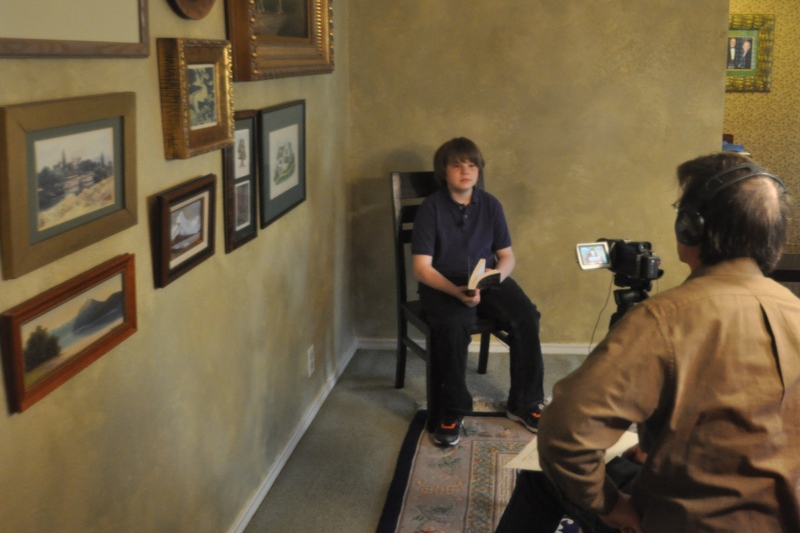 We used one wall of the dining room as a backdrop to tape an audition on Saturday. All the casting director will see is my upper body and the green wall behind me — they won’t see the furniture, rugs, or paintings in the room. The videographer is Gordon Smith of Altair IV Productions in Dallas. He’s nice, and very good. This was the first time I worked with him, and also the first time I shot an audition tape at home. After the audition, we had to leave right away for dress rehearsal at The Passover Experience. It’s a pretty long drive, and I was half-asleep when we got there. When I looked up, Jesus was opening the gate for us. OK, so it wasn’t actually Jesus, just the actor who plays him in the production. But, still, it looked strange to see a guy in gorgeous white robes opening a gate and waving the car through. (We were late, and most of the actors were already in their places, and he just happened to be walking by, so he opened the gate. I don’t want anyone to think the production actually has people dressed as Jesus opening gates usually.) The show starts on Friday, April 11, and continues on Saturday April 12 and Sunday April 13, then on Friday and Saturday April 18-19. You can get tickets at the gate, or online at this link. There are discount tickets for Friday, April 11, available at the gate. Anyway, dress rehearsal for the Passover Experience went well, but by the time my grandma and I got home around 7:30, we were both pretty tired and would probably have headed off to bed early. But around 8 o’clock, the doorbell rang, and it was my sister Krystal McAlister with her fiance Nathan Vargas and their baby Nathan Jr.
Krystal’s dad Geoff is visiting from California before he heads out on the road for gigs in Mexico, Dubai, and China (he’s a stuntman), and Krystal’s other brothers Ian and Duncan came up for the weekend to see their dad. That’s why Ian was able to help me with my audition — he read the off-camera parts when we taped, and rehearsed with me, too. So instead of going to bed early, we stayed up late just hanging out with the extended family and playing with Nathan Jr. He is really cute — I like being an uncle! When I started this blog, I said that my life really is a circus. Here’s more proof. This is what our family room looked like on Saturday night. See? 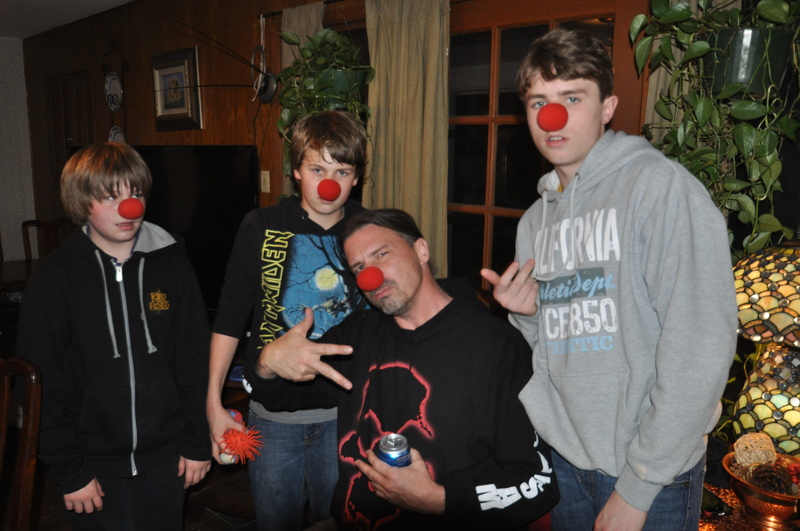 I’m not the only clown in the family! I’m on the left, Duncan, Geoff, and Ian McAlister are next. 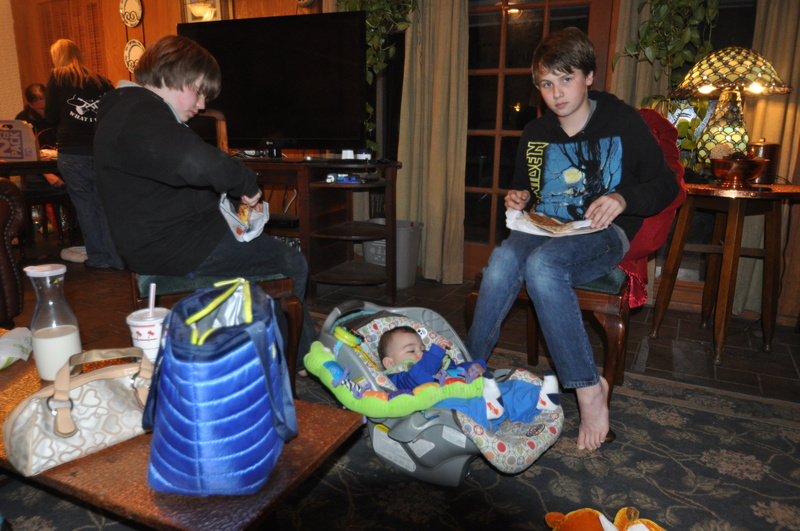 What you can’t see in this photo is the look on my nephew Nathan Jr.’s face. He’s just 8 months old and he loved the clown noses. Geoff says he doesn’t like this picture because it looks like he’s holding a beer in his hand — it’s a Diet Sprite — and he doesn’t want anyone thinking he’s playing with his kids and grandson while drinking. My sister Krystal is almost 23. Her baby Nathan Jr. is 8 months old, and Ian will turn 17 two days after I turn 13 in a couple of weeks. Nathan was chilling with two of his uncles (me and Duncan) while people served their plates, but he’s kind of looking at us like, “Hey, where’s my Taco Bell food?” But he got strained vegetables and formula instead.